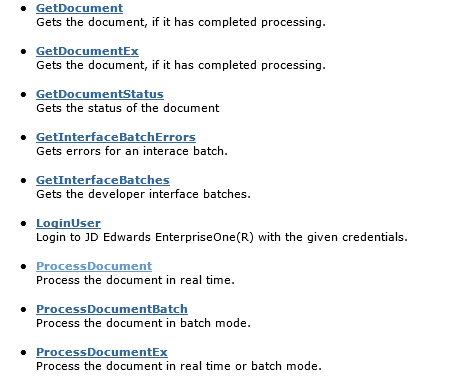 In this post, I’ll describe how to call a (LynX) business process through the web service. Note: This post assumes that you are calling the web service from .Net. The web service can be called by any external app that can consume web services. LynX Web Service provides a handful of methods/operations to submit and retrieve documents (if you are wondering why you can use the same web method for different E1 functions, read my previous posts). The web service is a SOAP based web service (we are working on a REST based implementation). Here is a partial screenshot of the operations provided by the service. document: the string representation of the XML document. The document must be in Unicode (utf-16) format. password: the E1 password of the user specified in the e1user attribute of the document. You can create the input document using any of the XML creation methods (XmlDocument, XmlWriter etc.). However, there is an easier way to do it: use the XML Schema to create a typed class and serialize the object to create the XML document. You can use xsd.exe to create the typed class. 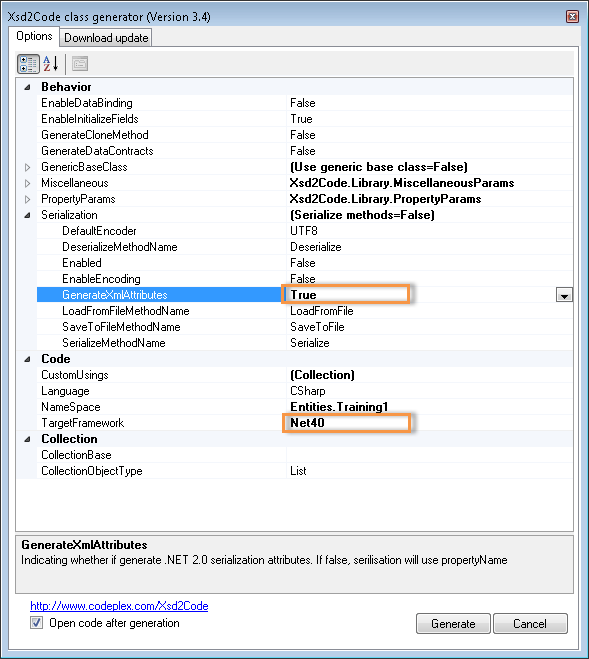 I prefer to use a tool called Xsd2Code to create typed classes as it is integrated with the Visual Studio IDE. You can download it here. Here’s a function to create a typed object for the business process ERP.EOne.Training1 (download the solution at the end of this post). To call the web service, you can simply add a service reference or just reference LynXProxy, a class library that is part of the product. // crendentails to access E1. That’s it! As you can see, it is pretty straightforward to create the input and call the business process through the web service. Here is the link to the Visual Studio (2010) solution. Categories: Uncategorized | Tags: .net, enterpriseone, integration, jde, web services | Permalink.